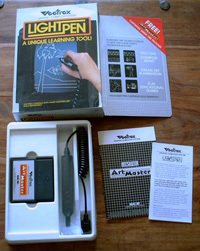 The light pen allowed direct drawing and manipulation on the Vectrex screen, and came packeged with Art Master, a drawing/doodling program. 3 other cartridges were made for use with the light pen - Melody Master (a music program that allowed you to write music notes on the screen and have them played), and Animaction (an animated drawing program). The was also one un-released but fully completed game called Mail Plane which was a flight simulation that allowed you to control an actuall plane that must travel around deliving mail. How does the Lightpen work ? The Lightpen sends a negative edge pulse to "button 4" when it senses a certain intensity of light. The software on the program cartridges places a "crosshair" on the screen or monitors predetermined text menu selections. By aiming the Lightpen at this crosshair it draws a shape similar to a bullseye. As the pen is moved, it crosses the rings of the bullseye and this new position is detected and made to be the new center. In this manner the bullseye crosshair may be dragged across the screen. If it is lost by the Lightpen, it must be "picked up" again. 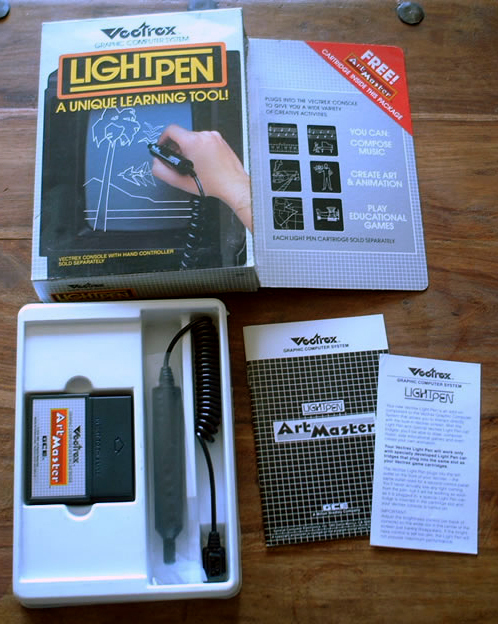 How to use the Vectrex Lightpen ? For most games plug the Lightpen into controller port 2 (left port) and a standard controller into controller port 1 (right port). Then activate the various functions by pressing one of the four buttons while holding the Lightpen 1-2 cm from the Vectrex screen. An exception to this setup is for the Engine Analyzer (on Sean Kelly's Multicart 1996-1999). For this program plug the Lightpen into controller port 1 (right port). Then select from a menu of choices by aiming the pen at a box. What is the Engine Analyzer good for? This program is an educational tool and has no real functionality. However, it does show an auto mechanic's example of good and bad graph functions that suggest certain problems with a particular car engine under analysis. I presume that GCE was thinking of marketing the Vectrex as a diagnostic tool to mechanics and this program was to be part of the training package. Of course the real Engine Analyzer program has never shown up, nor has the equipment for attaching it to the spark plug wires and ignition coil of a car. What about the Mail Plane game? This is rumored to be a completed Lightpen game that was never released by GCE or MB. Two prototype cartridges have surfaced recently (May, 2000). The owner of one is Jason at Retrogames who owns a Mail Plane produced by MB, and the other is FRW (Ebayzilla) who owns one produced by GCE. Jason had a nice scan of the article on his site which appeared in issue No.10 Page 5 of his Retrogames magazine. Unfortunately, I don't see it there anymore. The article is titled "MAIL PLANE DISCOVERED!" and goes on to tell about the Mail Plane cart Jason owns with a complete description of the game and screen shots. FRW's Mail Plane was auctioned off one eBay.com with a starting price of $5000.00. Unfortunately, nobody came up with the cash to purchase it...so it remains unreleased to the Vectrex community.